Newly inducted and veteran Gallia Academy High School National Honor Society members are, row one from left to right: Grace Montgomery, Kirsten Hesson, Katie Queen, Timothy Hill, Reece Thomas, Cade Roberts, Benjamin Cox, Brady Angel, Claire Hamilton, Brooke Johnson, Macy Jones, and Abigail Johnson. Row two from left to right: Megan Bailey, Peri Martin, Rebecca Sydenstricker, Tessa Skinner, Barbara Wright, Eliza Davies, Morgan Loveday, Bailey Meadows, and Alex Barnes. Row three from left to right: Cory Call, Clay Montgomery, Elijah Baird, Brittany Masters, Mariah Liberatore, Madalyn Williamson, Kiesla Kormanik, Cheyenne McGuire, Ashton Webb, Taylor Burnette, and Bo Saxon. Row four from left to right: Abigail Cremeans, Molly Fitzwater, Tea McCarley, Morgan Stanley, Derek Henry, Gretchen McConnell, Elizabeth Hoover, Ashley Turley, Taylor Staton, Haylee Polinsky, and Wyatt Sipple. Row five from left to right are National Honor Society Officers:Treasurer, Justin McClelland; Secretary, Katie Carpenter; Vice-President, Cole Davis; President, Lane Pullins. Not Pictured: Brett Sisson and Jenna Wood. 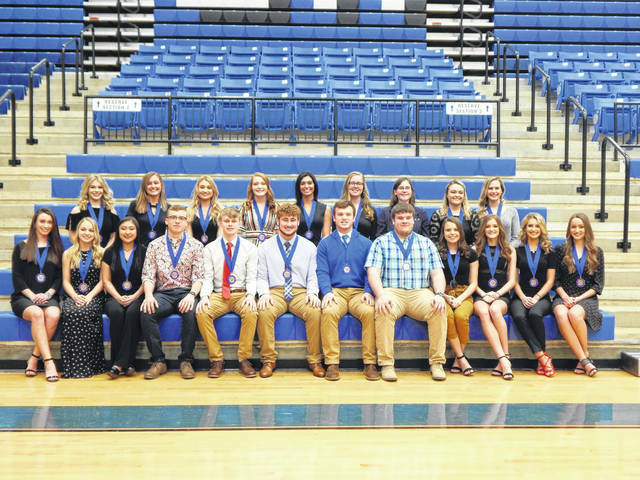 Newly inducted Gallia Academy High School students, row one from left to right, are: Grace Montgomery, Kirsten Hesson, Katie Queen, Timothy Hill, Reece Thomas, Cade Roberts, Benjamin Cox, Brady Angel, Claire Hamilton, Brooke Johnson, Macy Jones, and Abigail Johnson. Row two from left to right are: Megan Bailey, Peri Martin, Rebecca Sydenstricker, Tessa Skinner, Barbara Wright, Eliza Davies, Morgan Loveday, Bailey Meadows, and Alex Barnes. 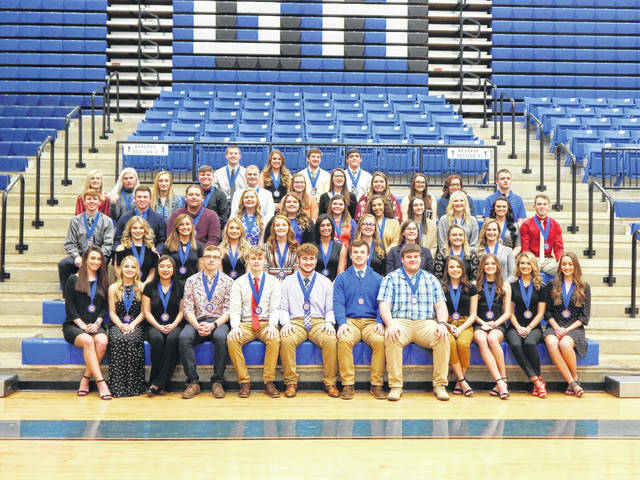 CENTENARY — Twenty-one students from Gallia Academy High School were inducted into membership of the National Honor Society in an evening ceremony held in the Holzer Center for the Performing Arts at Gallia Academy High School on Thursday, March 7, 2019. Members were selected by a faculty council for meeting high standards of scholarship, service, leadership, and character. The National Honor Society ranks as one of the oldest and most prestigious national organizations for high school students. Throughout the year, members of the chapter serve as role models for other students. In addition to the strong academic records which established their eligibility for membership, chapter members are leaders in many student organizations and serve the school and community through many activities. The GAHS chapter has been active since 1929. Currently there are 49 active members at GAHS.